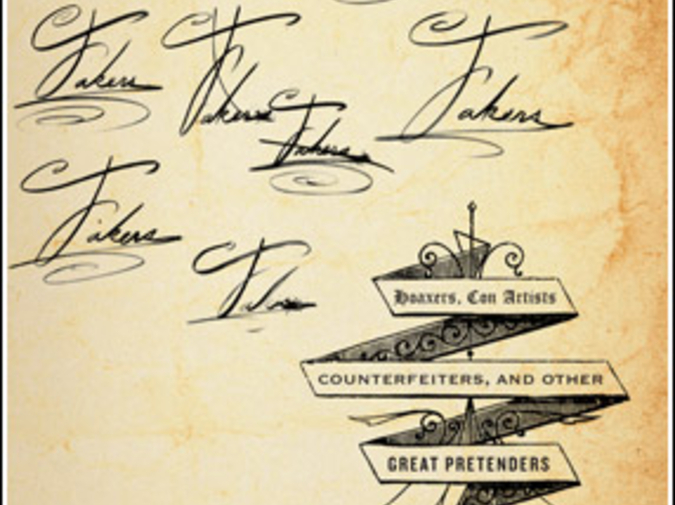 Paul Maliszewski's Fakers: Hoaxers, Con Artists, Counterfeiters and Other Great Pretenders, was published in January by The New Press. The book is a collection of essays, interviews, and reports about literary fakery and other manners of hokum. Maliszewski investigates why writers turn to fraud, why audiences seem ever-susceptible to cons, and the line between a literary con job and a work of art. Paul has published essays and stories in Bookforum, Harper's, Granta and the Paris Review, and he has twice received a Pushcart Prize. He was kind enough to converse with Hobart over e-mail about this, his first book. I was struck by how thin the line is between a literary hoax and a genuine literary work, by which I mean a work of art. It's like quicksilver almost, the way something can flash back and forth across that line, depending on how the author handles the subject and his or her relation to the audience. Is the line that thin? I'm not sure it is. Would anybody confuse Clifford Irving's Autobiography of Howard Hughes with Remembrance of Things Past? One of the things I tried to do while writing the essays in Fakers was to keep those lines distinct. Motive matters and so does intention. A satirist may employ aspects of a hoax — satires often pretend to be something else, such as the way "A Modest Proposal" pretends to be an overly earnest lecture for the public good — but not all hoaxes are satires. Still, fakers are often celebrated as great artists and praised as exceptional practitioners of their craft. Stephen Glass, we're told, was a brilliant writer. JT LeRoy practically had a waiting list to join his celebrity admiration society. More recently, Margaret Seltzer, the woman who presented Love and Consequences as an accurate description of her wholly imaginary life as a gang member, earned the sort of accolades and good reviews that many authors would crave. But all that may say more about the state of criticism and the relative cheapness of praise. Maybe it's just a case of the artist making the mistake of breaking faith with his audience. But the articles in the New York Sun from the 1830s about the discovery of a civilization on the moon, which you describe in the chapter "Paper Moon," certainly those were charming and filled readers with wonder. Stephen Glass, whom you profile, wrote articles which, maybe, are great in every sense except that they weren't true. I also like the chapter on Sandow Birk, who makes fake history paintings of the mythical war between Northern and Southern California. I've never seen the paintings, but they sound marvelous. He seems to have been thrown in as a counter-example, maybe. Presumably no one is going to be tricked into thinking there really was a civil war in California and that it was recorded in history paintings. I guess my question is this: What drew you to the fakers you report on in the book? Because it does seem that their various enterprises say something about the making of art, whether good or bad. Do you know Donald Barthelme's story "Rebecca"? At its conclusion, Barthelme writes, "The story ends. It was written for several reasons. Nine of them are secrets. The tenth is that you should never cease considering human love, which remains as golden and grisly as ever, no matter what is tattooed upon the warm tympanic page." The opposite was true for these essays: most of the reasons I wrote them are apparent in how I discuss each fake and what I focus on. Only one reason was a secret, mainly because it seemed of little interest to anyone else. In 1997, when I started writing the satires that became "I, Faker," the first part of this book, I'd recently finished a graduate program in creative writing and taken a job as a reporter at a business newspaper. In my own obtuse, backwards way I was trying to understand what stories were and how best to tell them. The satires — letters to the editor that I submitted under made-up names as well as news articles and opinion columns — were motivated by my dissatisfaction with the newspaper, with how we were encouraged to write optimistically about business in what was and really still is one of the more economically stagnant regions in the country. But the satires also grew out of my equal dissatisfaction with literary publishing. When I thought about taking what I observed at the paper and, in that time-honored and opportunistic way of all writers, "turning it into a story," something about it felt false and even misguided. I wanted to write these criticisms of the business world that took the form of fiction, but I worried my inventions would seem like thin facsimiles of the real thing I knew. Not a newspaper, you know, a "newspaper." Not a reporter, a character who introduces himself on the page as "the new reporter." Also, I suspected it unlikely that a literary editor would share my vision. What journal of that time would publish satiric business columns by puffed-up captains of industry? And even if, ideally, such a journal existed, what audience would I be addressing? Fellow MFA graduates, English professors, and aspiring writers — people, in other words, who agreed with me. Clearly, I wouldn't be writing to businesspeople. So I decided to take my fiction outside of literary publishing, into the world as it were, and reach a different audience. I didn't just write stories in a realistic mode, fictions that seemed believable as stories go. I wrote satires that were accepted as actual contributions to an actual newspaper. As for why I wrote about these fakers and not others, I had no fixed criteria, but I was drawn to examples in which the fakers were complicated characters. Fakers though, while fascinating, aren't always knowable. Even when they offer up their mea culpas, as Jayson Blair did with his memoir or Stephen Glass did with his closely autobiographical novel, they aren't the most reliable of narrators. In addition, you're right to point out that not all the fakers in the book are up to anything criminal or wrong. They're all, however, makers of things, fabricators, and they're all using some form of deception. But as I said above, motive matters. You can deceive a passerby in order to relieve him of his money, or you can deceive people in order to invite them to question their values, as the best satire does. So I also liked cases where the deception seemed just impossible to believe and yet believed it was. I mean, can you imagine convincing the people of New York City, in 1835, that tribes of man-bats were observed living on the moon? It's incredible, in every sense of that word, and yet it was, for a time, also accepted as true. Finally, the people who were fooled intrigued me. Why, I wondered, might people have believed in that moon hoax? What was in it for them? And why did so many editors rush to publish Stephen Glass? What was it about the stories these fakers told that made so many people want to believe in the fiction? Yes, one thing that comes through is that we seem to want to fall for incredible stories. It also strikes me that writers of satire are in a different position than writers who try to pass off fake stories as true. The former might be forgiven for tricking the audience to make a point, but with the latter, when the hoax is revealed the audience feels betrayed. Of all the fakers I wrote about, I feel the most sympathy for the satirists. On a good-bad continuum, they're way over on the good side, even when I disagree with their views, as I do the anti-modernists who created the Spectra poets and Ern Malley. But on a deceptive-forthright continuum, satirists are also among the sneakiest of the fakers. Consider that none of Jonathan Swift's satires was first published as his own work. Some writers suggest his authorship of Gulliver's Travels was a bit of an open secret, but nevertheless it remained important to Swift that he have a mask, this invented persona — Lemuel Gulliver, adventurous sea captain — between him and readers. And so the book appeared in early editions not as Swift's inventive fiction but Gulliver's travel logs, his memoir we would say today. I also think of Report from Iron Mountain, although I didn't write about it in my book. In 1967, in the midst of the country's deepening involvement in Vietnam, Dial Press published what seemed like the leaked proceedings from a high-level commission convened by the government to study "the possibility and desirability of peace." What would happen to the United States if there was a period of sustained peace? Was sustained peace even desirable? The study group concluded peace was not in the real interest of the country. This was a satire — still the purest we've seen in years — and nothing about the book gave away its intentions, not the cover or the dust jacket flaps or anything else. The author was Leonard Lewin, who contributed only an introduction to the first edition, to explain how this sinister document came into his possession. Years later, in 1996, when the book was reprinted, it was clearly labeled a satire. The cat was declawed. But in the intervening years, the report enjoyed many odd and unpredictable lives. Some people, for instance, took to publishing bootleg copies of the report. According to one account, the report was widely for sale at gun shows. To the black helicopter crowd, to the militias and the new-world-order paranoiacs, here was all the evidence needed to understand our government's secret plans. Any high-minded claims of the document's supposed literary or satiric nature, they simply chalked up to a later cover-up. The government never wanted people to read such a damaging and revealing report, ergo they had to concoct some story to explain it away. What interests me in all this — and I'm afraid I've strayed some from your question — is the way that satire requires that authors put work out there in some unlabeled or mislabeled state, but there's a catch, because that means opening the work up to wild misinterpretations. The poets who invented Ern Malley were overjoyed when reporters took an interest in their hoax. What had been a literary event, taking place in the teapot-sized world of literary journals, leapt into the pages of national newspapers. The poets expected, optimistically, that what would follow would be a discussion of the invention on their terms, a discussion, namely, of the merits and demerits of modernism. So they were quite disappointed by the result, which was more about sensationalism than any sensible debate. Sure, their invention became notorious, but nobody was really discussing the finer points of their satire. On a much humbler scale, I had my own Ern Malley moment. Nobody wrote about what my carefully plotted satire revealed. Nobody compared the flimsy virtual business I concocted with the just as flimsy brick-and-mortar companies that business newspapers routinely extol. And yet, I thought, I'd given them all that they needed to see the truth. So why didn't the scales fall from their eyes? Instead, the hoax was just some kooky story of the day. Local journalists wrote about the weirdness and moved on. So I agree with you: satirists do try their best to trick their audiences in order to — they hope — make a point, but the audiences get the last word or maybe laugh, as time and again, satirists are left saying, in effect, "Oh, but you're missing my point. It was actually all a joke, don't you see? What I was trying to say was...." And by then, of course, nobody's listening to the satirist. I'm curious to know what you think though. You've written quite a lot of political and current-events humor, much of it satiric, in that you work indirectly, backwards even, giving convincing voice to the opposite of your own beliefs. And, perhaps not surprisingly, you've also had a close brush with people not getting it. Actually, I'm not sure I agree that satire requires fooling the audience. In a piece of satire you can decide how easily to give the game away. The Onion, for example, makes no pretense about what it is up to. Even the editorials, which rely on personas, could not be taken seriously. The problem might be that when it's clear you are joking, at least when you are writing the piece, it feels you are somehow giving away any chance to persuade the audience. That can be frustrating if you feel what you're saying is important. During the presidential election campaign I was writing things for 23/6 and The Huffington Post, and I was trying my best to explain why a John McCain presidency would be a continuing disaster for America. And yet I often felt I wasn't making a difference. The pieces might have been entertaining, but they would never persuade anyone. So I think I understand the impulse to trick people. You think it will force them to take you seriously. Then again, maybe the desire comes from wanting to make the satire complete. I mean, Report from Iron Mountain. What a perfect and complete thing to have made. So a piece of satire that tries its best to fool people probably represents the highest form of the art. But then, as you point out, that kind of satire is also the most dangerous. The closer to reality it is the better it will be, and yet when it gets close to the bone people will get fooled. You're playing with fire, in a sense. This is all compounded by the fact that, as a writer, you always assume the people you are really writing for — your true audience — is one step ahead of you, and therefore what you are doing is harmless. The whole thing is very tricky. About your last point: Yes, it seems you can always be misunderstood. I wrote a piece about Obama negotiating a treaty with France on his European tour. The idea was that he was over there, and he started talking to Sarkozy, and they found they agreed on so much, and hey, Obama's already in the Senate, he's going to be President in a few months anyway, why not just negotiate a treaty? A right-wing blog posted my piece as proof of Obama's arrogance. "Look at this," they said, "the guy is negotiating treaties before even getting elected." The close call you refer to involved two agents from the Secret Service waking me up at 6 a.m. to interrogate me about a piece I'd written for 23/6 that joked about Harry Reid offing Hillary Clinton to cut short the Democratic primaries. Their visit was extremely unnerving, almost terrifying. But I also thought: I must not be as funny as I like to think, because if the piece had really been funny these guys would not be here. Of course, I also felt really bad about wasting their time. But on the whole it was just completely bewildering. It could not be happening and yet it was. These guys were the real thing. My little piece of satire was spinning out of my control. I like those stories. Satire gone wrong — somebody should make an anthology. I hadn't heard about the right-wing blogger latching onto your Obama-Sarkozy piece as proof of his worst fears. It reminds me of the Vonnegut novel Mother Night, in which Howard Campbell, an American playwright living in Germany, is recruited by the Allies to spy on the Nazis. The Germans have their own plans and set Campbell up as part of their propaganda machine in the hope that he can persuade Americans to their cause. But his radio addresses contain an intricate coded language only the Allies can understand. His pauses, even his coughs, are meaningful. Later in his life he learns that, however useful he was as a spy, his speeches were themselves persuasive. Forget the code, his vile content actually moved people. He thought he was only pretending, but he was a better Nazi than he realized. A white supremacist group celebrates his achievements and asks him to speak at their meetings. What a wonderful allegory for the power and the risk of satire. Let's switch gears. Has seeing the book published diminished your fascination with hoaxes? Are you still captivated by them? Oh, I'm still pretty captivated, but these days I'm not writing about hoaxes. I have, however, been reading The Sun and the Moon, a new and well-researched account of the moon hoax we mentioned earlier. I also recently got interested in Albert Koch, a man who claimed, in 1845, to have unearthed skeletons of giant sea serpents, in Alabama of all places. And, of course, I doggedly follow whatever comes up in the news. In November, a group, probably the Yes Men, published a hoax edition of theNew York Times, less satire than optimistic vision of the future ("Iraq War Ends," reads the banner headline). During the Presidential campaign, I got drawn into reading about that McCain volunteer who falsely claimed she was mugged and mutilated by an Obama supporter. It reminded me of a nearly identical and just as disturbing story from December 2007, when a student at Princeton claimed, again falsely, to have been slammed into a wall and beaten, he said, with a bottle of Orangina, all because of his conservative views, namely his writing in favor abstinence and decrying promiscuity on campus. Here, in both cases, was one of the hoariest conservative myths made literal, that oft-told tall tale in which a brave and typically solitary conservative is victimized by an overwhelming and pervasive liberal power that actually doesn't exist. There seems to be fakery everywhere, once you open your eyes to it. Well, I never did have to scrounge for good examples. Paul, thanks so much for doing this. Thank you, Sean. It was my pleasure. Sean Carman is, among other things and for lack of a better descriptor, the Hobart Blog Editor.